SlingApp is a job-hunting app that uses the simple swiping process to match employees with their desired jobs. The app now has two new features to help speed up the screening and interview process for employers. SlingApp now has a freemium subscription plan for employers who are looking for urgent or mass hiring. Last year, we covered SlingApp, a job-hunting platform that incorporated the simple swiping process most millennials are familiar, thanks to Tinder. Their goal wasn’t to compete in the same field as other big players in the saturated job-hunting platform scene. Instead, they wanted to focus on helping high turnover jobs find employees fast, without expending too much effort. And it was this concept that appealed to the market. Over a year, SlingApp has managed to get over 800 employers onboard along with helping 1,000 employees get hired from using the app. Now with the growth of their business brings about new ambitions, so the team has come up with a few additional features that hope to elevate their services further. Generally, after posting their vacancies on a job platform, employers can only hope they’re able to find the right candidates among the many applicants sending their resumes over. SlingApp wants to speed this process up by introducing two new features: the Auto-Interviu and Smart Filter. When employers use the platform to post jobs, they can pre-select applicants based on a certain set of requirements, such as past experience, education background, language, nationalities and more. 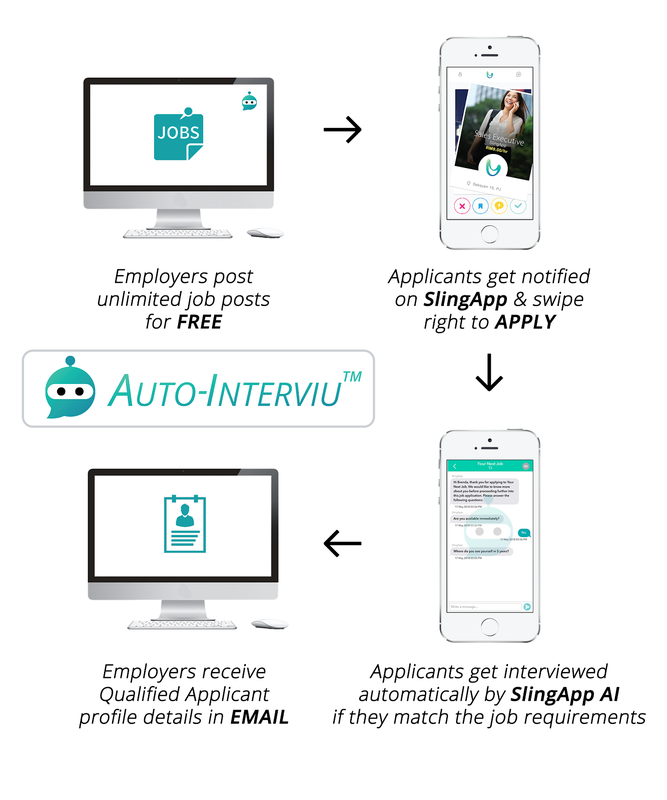 Aside from that, SlingApp provides an option for employers to set up 5 Auto-Interviu (AI) questions, which extracts specific details from the applicants relating to the criteria of the job they’re applying for. So when a job posting goes live, a list of applicants will match to it via the Smart Filter. 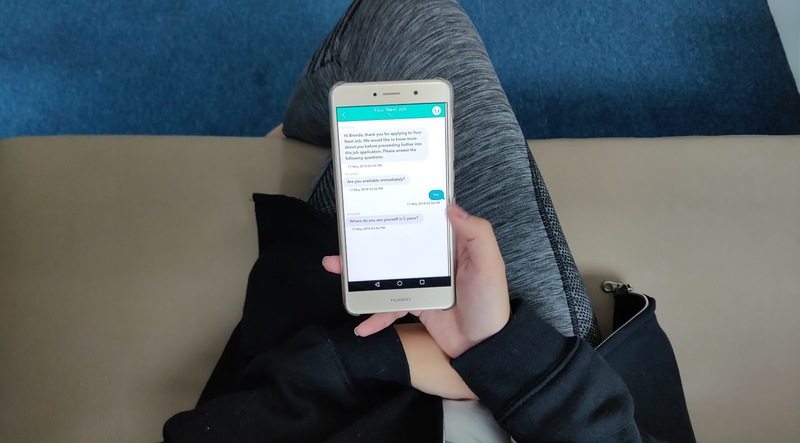 From there, the SlingApp AI will interview the applicants automatically via the chat message function on the app. Once the AI questions have been answered, their profiles and answers will be e-mailed to the employers immediately. These additions to SlingApp have benefits for both those looking for jobs and those who’re offering them. Job-seekers can apply for more jobs in a short period of time because the process now cuts down the need for you to put in unnecessary details and only focus on the questions the employers ask via the Auto-Interviu. This comes as a solution for an issue they had when they had first launched with their simple job application method that resulted in hot job postings getting over 1,000 applicants per vacancy. It’s an industry-wide issue and SlingApp is one of the firsts to overcome this using automation with SlingApp AI. Now if you match the job requirement, you’ll be interviewed immediately so it reduces the waiting time of reaching out to each other that usually happens between the employer and the candidate. For employers, the AI feature is said to help save more than 70% of your time and effort in terms of applicant screening and interviews. We all know the process can be quite tedious so this step aims to help by shortlisting the candidates that have a higher chance of being hired. “With a vision to become the fastest hiring platform, we managed to fulfill one of our missions which is to match applicants to a job within 1 minute,” said TJ from SlingApp. Compared to their platform when it first launched, SlingApp has gone through a few updates aside from the addition of their 2 latest features. One of the changes is now, after an employer has posted a job, they’re no longer prompted to login to the hiring system to check for applicant details. All the qualified applicant details would be sent to employers via e-mail. Another difference is the introduction of their Freemium Subscription Plan. Those familiar with SlingApp before would know they ran on a credit plan, but now it has shifted to a subscription plan to implement their SlingApp AI function. With the Hire FREE plan, all employers can post unlimited jobs for free on SlingApp and get up to 2 qualified applicants per week for free. The Hire UNLIMITED plan is more curated for employers who are urgent or mass hiring because they’re able to access to all applicants’ details, including qualified applicants from only RM249/month. Certain interface changes were also done, such as upgrading the job categories from 17 to 26, allowing for full-time job postings from only having part-time and internship vacancies, as well as requiring applicants to fill in more information like work experience, education background and expected salary. These were all made with the employers and employees in mind as SlingApp talked about their desire to keep on upgrading their platform. And with over 20,000 downloads so far, the team’s looking to continue helping Malaysians match with their ideal jobs efficiently. This article was written in collaboration with SlingApp. For jobseekers who want to download SlingApp, you can click here for iOS or here for Android. For employers, you can start posting jobs by clicking here. You can also find out more information about SlingApp on their official website here. Is RM1k Too Much To Attend M’sia’s First Major Blockchain Event? Maybe Not.